When it comes to Halloween, I tend to lean away from all the scary. I know Halloween isn't usually described as "cute" but if you can't tell already, that's just how I like to do things around here. Pumpkin decorating/carving is a yearly tradition at my house and we always have so much fun doing it. My husband and I try something different every year which I like because it switches traditions up a bit and gets those creative juices flowing. This year, I came up with this no carve googly eyed pumpkin tutorial. (I love that no carve pumpkins are wayyyy less messy!) This idea was inspired by those scenes in cartoons where the characters wind up in a pitch black room and all you can see is the emotion they express with their eyes. It felt Halloween-esque to me and I went straight to the drawing board with it. I really love how these googly eyed critters turned out and of course, I felt the need to jazz the pumpkin up a bit with some pastel paint, too. Hey, Halloween could use more pastels in its color palette, right? Anyways, I describe this as cute spooky...ok ok, let's be real,"Cute Halloween" probably isn't going to catch on but a girl can try, right?! 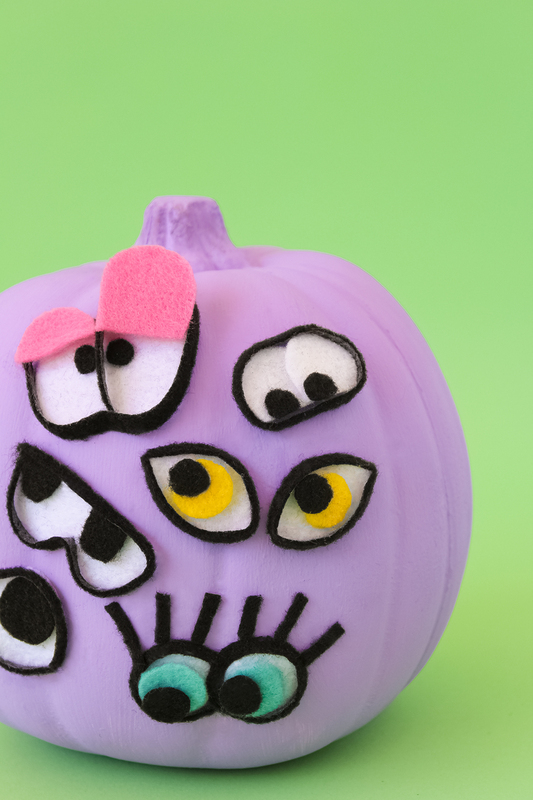 If you want to learn how to make these fun googly eyed pumpkins, follow the tutorial below and be sure to share your creations with me on Instagram using #crafterward! I can't wait to see your creative take on this! 1) Paint your pumpkin any color you like. I chose a pretty pastel purple for mine. 2) While the paint dries, cut up different eye shapes from your felt. I made some eyes different colors while I also kept some of them black and white. Feel free to mix it up and get creative with it - make eyebrows, eyelashes, a critter with one eye or maybe even four! 3) Visualize how you want to space out the eyes on your pumpkin. You can put them on different areas to see what you like best before actually gluing them. 4) Once the paint on your pumpkin is dry, glue the felt eyes onto your pumpkin and enjoy your festive new Halloween decoration! Copyright © 2019 Crafterward. All Rights Reserved. Subscribe to our newsletter and join the P A R T Y!